Cattail Pond sits in a serene, sunlit woodland opening at the edge of our forest, just a few quick steps outside our back door. It is a special place, nestled into one of the few areas on the property that is free from undulating topography, naturally protected by a steep slope uphill from it and surrounding trees. Taking all of this into consideration, it’s not surprising that there are also ruins of a barn near the pond, part of a former homestead and a reminder of the rich history of this land. 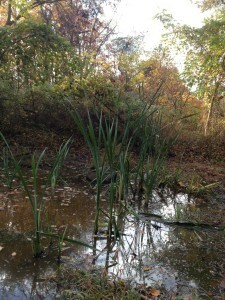 Woodland vernal ponds like Cattail Pond are most active in the late winter and early spring, when water is abundant and vegetation is emerging. They play an important role in maintaining ecological biodiversity by providing food, water, and habitat to toads, frogs, turtles, birds, insects, and other reptiles, amphibians, and invertebrates. Additionally, the pond functions as a stormwater management tool, slowing and filtering water from the adjacent hillside before it enters the stream, and eventually, the Schuylkill River. 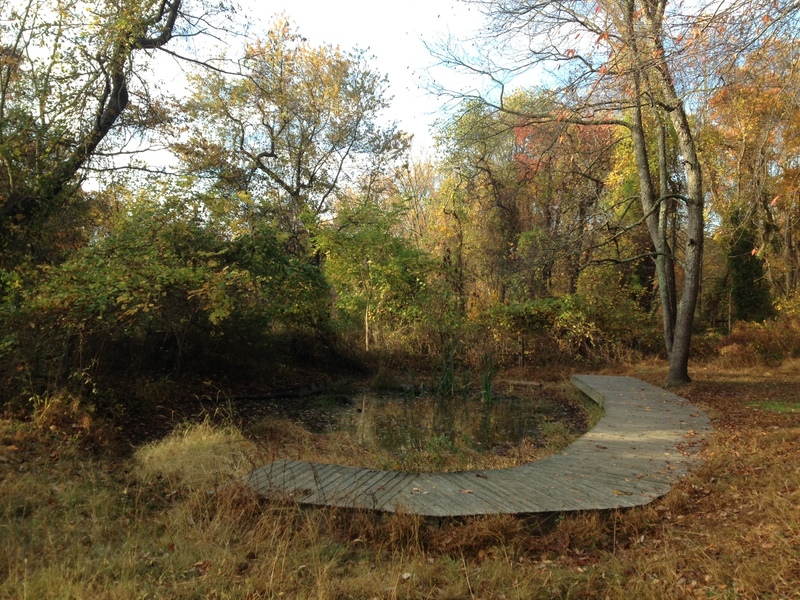 As one of a handful of manmade ponds the Schuylkill Center built in the 1970s, Cattail Pond has served as an important teaching tool for decades. Thousands of students have knelt there to observe and learn about pond ecology; Nature Preschoolers often spend afternoons running through the grass around the pond and peering into the water in search of frogs; for the casual visitor, the little wooden dock offers a quiet place to sit and watch light, quietly waiting for a turtle to nose up from the water. But, like many well-loved things, our pond is beginning to show signs of wear. 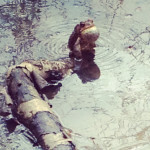 The thirty plus year old pond liner is punctured and not holding water as it should, which shrinks the pond’s effectiveness for both humans and wildlife, alike. This becomes most obvious in the hotter, drier summer months, when the pond is reduced to a mud-filled depression, void of any water. This summer, we were awarded a grant from ArcelorMittal Conshocken to restore Cattail Pond. Thanks to the generosity of ArcelorMittal, a longtime supporter of the Schuylkill Center, this fall we’ll begin the first phase of this restoration: removing the old liner, replacing it with a new one, and clearing invasive vegetation. Then, in the spring, we’ll plant a variety of native shrubs and trees with the goal of increasing biodiversity, improving habitat value, and restoring a balanced ecosystem. We’ve already begun the restoration process by surveying and documenting existing vegetation to provide baseline data and to inform our choice of plant materials. I happily discovered many moisture-loving native plants that have found their way to the pond’s edge and seem to be doing well, co-existing among the non-native invasives. Others, like a few vine-laden ash trees, need our help to avoid being smothered by the vigorous growers. We’ll be focusing on this area during an upcoming Restoration Volunteer Workday on Saturday, November 15 to get a jump-start on removing invasives and prepping the area for spring planting. Please get in touch with me by email at Melissa@schuylkillcenter.org if you’d like to volunteer and help out. I guarantee the toads will be singing you a song of thanks this spring. This entry was posted in Conservation, Education, Land Stewardship, Nature and tagged land stewardship, native habitat restoration, native plants, nature, restoration, Wildlife Conservation. Bookmark the permalink. We love this pond and so happy to hear about the grant, Melissa!